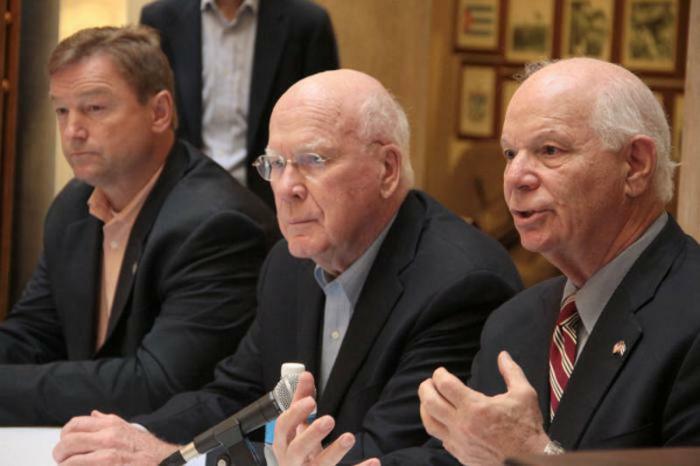 Why Did Senator Patrick Leahy and Two Other Senators Make A Trip to Cuba Last Week? On June 25 three U.S. Senators arrived in Cuba: Senators Patrick Leahy (Dem., VT) and Ben Cardin (Dem., MD), who have been there before, and Senator Dean Heller (Rep., NV). There has been no recent development that seems to have prompted this trip, which prompts the question: why this trip at this time? They met with (i) Miguel Diaz-Canel, Cuba’s First Vice President and heir-apparent to Raul Castro, (ii) Josefina Vidal Ferreiro, Director General of the U.S. Ministry of Foreign Affairs, and (iii) other Foreign Ministry officials. They discussed relations between Cuba and the United States and the debate currently taking place in the U.S. Congress on the elimination of restrictions on travel and trade with Cuba and the lifting of the U.S. embargo (blockade).They also met with religious leaders, ambassadors and others in Havana and the eastern city of Santiago. The only Republican in the group, Senator Heller on his first visit to Cuba, said, “When the president is right, I support Obama, and he is right in the case of Cuba. Heller acknowledged that there is still much resistance to change in Congress. One way to overcome this resistance, he said, was for Americans to travel to Cuba to talk to people and see the reality with their own eyes. “That will change minds and hearts as has happened to me.” Heller, by the way, is a member of the Senate Committee on Finance; its Banking, Housing, and Urban Affairs Committee; its Committee on Veterans’ Affairs; its Commerce, Science, and Transportation Committee; and the Senate Special Committee on Aging. At the start of this post, I said there has been no recent development that seems to have prompted this trip. That is true and reveals, in my opinion, the reason for this trip at this time. By now many in the U.S. at least were expecting that the two countries would have announced that they were re-establishing diplomatic relations and thus converting their interests sections into embassies. Keys for that anticipated announcement in June were the May 29, 2015, U.S. rescission of its designation of Cuba as a “state sponsor of terrorism;” the Cuban Interests Section establishing a banking relationship with a bank in Florida; and a reported agreement regarding conditions for U.S. diplomats’ travel in Cuba. Thus, in my opinion, the reason for this trip at this time was for Senator Leahy to attempt to determine whether there was some unknown reason from the Cubans for the lack of such an announcement and to press them to conclude the agreement for re-establishing diplomatic relations. Leahy also in the private discussions with the Cuban Foreign Ministry officials may have talked about political reasons from the U.S. perspective to have an announced re-establishment of diplomatic relations as soon as possible. After all, in his public comments in Havana, Leahy stressed the desire for a prompt opening of embassies and the need for the U.S. to open a full embassy. Let us hope that in the next few days or weeks there will be an announcement of the resumption of diplomatic relations. This post is based upon the following: Assoc. Press, Leahy Heads US Senate Delegation to Cuba Ahead of Embassies, N.Y. Times (June 26, 2015); Diaz-Canel received US Senators, Granma (June 26, 2015); Miguel Diaz-Canel meets with US Senator Patrick Leahy, Marti (June 26, 2015); Senator Leahy in Havana: The blockade has been an error of US policy, CubaDebate (June 27, 2015); Gomez, Normalization is the right way, say US senators in Havana, Granma (June 27, 2015); Assoc. Press, US Sen. Leahy Sees ‘Positive Change,’ Work to Do in Cuba, N.Y. Times (June 27, 2015); Reuters, U.S. Senators Visit Cuba, Hope Congress Will Ease Restrictions, N.Y. Times (June 27, 2015); Schamis, Obama’s Cuba and its discontents, El Pais (June 28, 2015).